Cellular shades are energy-efficient and stylish so you can reduce energy bills in winter and summer. Hunter Douglas cellular shades are made with a patented cellular construction to increase energy-efficiency at the window. The fabrics on these window shades are made to reduce your energy bills. You can choose from varying levels of energy-efficiency based on which window shade fabric you choose. 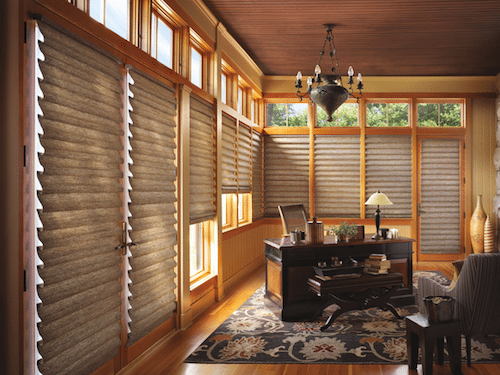 Duette® Honeycomb Shades have three different levels of energy-efficient fabrics. You can select from single layer, double layer or triple layers of insulation to keep your home warm in winter and cool in summer. The more layers you have on your windows, the more you conserve energy. Duette® Honeycomb shades are also available cordless or with Hunter Douglas PowerView® Motorization for child and pet safety. Alustra® Duette® Honeycomb Shades are a luxurious collection of the best window shade fabrics. United Decorators carries the full-line of Alustra® window shadings with metallic covered headrails, exquisite fabrics and beautiful textures. Alustra® Duette® Honeycomb Shades are energy-efficient window shades with an exclusive line of fabrics with the best colors, and hardware available in the window treatment industry. 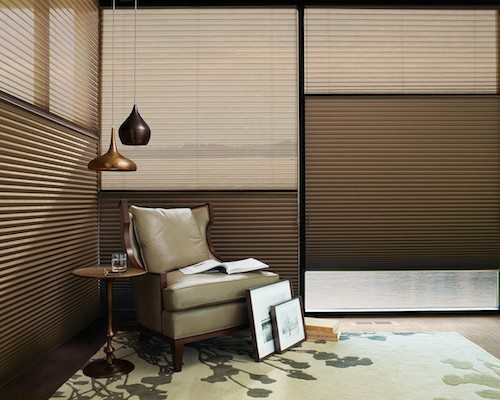 Solera® Soft Shades are cellular shades with a soft look. Solera® differs from Duette® Honeycomb shades since it has soft curves like that of a roman shade. Solera® has many different fabric options to control the light such as light-filtering or room darkening. The sun can shine bright in a room all year round. 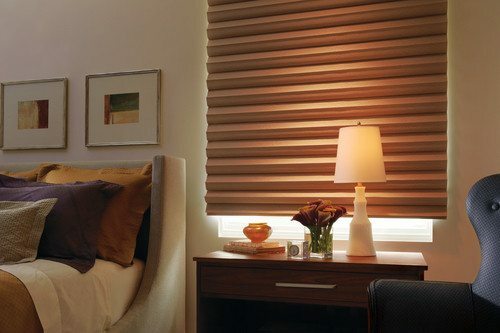 Room darkening shades are perfect for blocking the light in media rooms or bedrooms. The window treatment experts at United Decorators can show you a stunning selection of woven and non-woven fabrics to coordinate with your home décor. Sonnette® Cellular Roller Shades combine the beauty of two window shades in one for a one-of-a-kind look on your windows. Sonnette® is the latest collection of Hunter Douglas shades to combine cellular shades and roller shades all in one. Sonnette® Cellular Roller Shades have an innovative curved shape on the fabric vanes to transform light. Sonnette® Roller Shades are cordless creating a stunning and streamlined window covering for your home. Vignette® Modern Roman Shades have consistent 3” or 4” folds. The roman shade fabric folds are available in both horizontal and vertical orientation. You can cover sliding glass windows, horizontal dining room windows, bedroom windows and living room windows with roman shades. The fabric of Vignette® Modern Roman shades are wrinkle free with rich textures and beautiful hues. Vignette® Modern Roman Shades feature fresh new fabric colors that are durable with exceptional insulation. 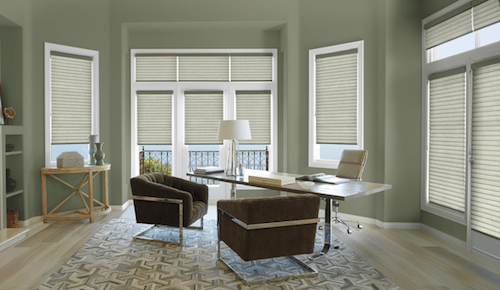 If you are searching for a contemporary window treatment, Vignette® Modern Roman Shades just might the solution to your window covering needs. The Hunter Douglas Energy Smart Style Savings Event is going on now ‘til 4/9/18 at United Decorators. You can save on select Hunter Douglas energy-efficient shades and reduce your energy bills all year round. 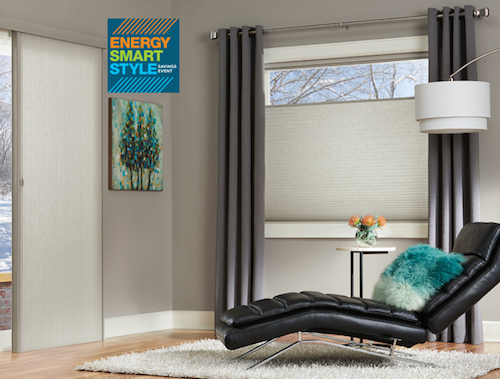 You don’t have to compromise on style with energy-efficient window shades. Cover your windows with energy-efficient window shades and save in more ways than one. Learn more about a $100 Rebate on select Hunter Douglas shades before Passover and Easter at United Decorators. Schedule a free design consultation today at 718-253-9300.